Key risks include delayed germination, slow growth rates, poor nutrient availability, disease issues, insect feeding, imbibitional chill injury, and frost damage. Benefits of Early Planting. Long-term university studies have demonstrated that early planting provides the best opportunity for maximum corn yield. Early planting ensures that the plant can fully capitalize on solar radiation to drive growth and yield. Plants may reach reproductive stage more quickly and are less likely to pollinate under hot, dry conditions. Early planting helps capitalize on management scenarios involving high plant populations, full-season hybrids, and high fertility. Planting early also typically results in earlier harvest of grain at lower moisture levels, which can lead to lower drying cost and open timely opportunities for fall fertilizer applications, successful cover crop establishment, and fall tillage. Soil Temperature. Germination is driven by water absorption into the seed during the first 48 hours after planting, a process called imbibition. If rainfall occurs and soil temperatures drop much below 50 degrees F during this critical first 48-hour period, the risk increases for imbibitional chilling injury and cold stress. Chilling injury ruptures cellular membranes, causing a host of negative symptoms, including aborted radicals and coleoptiles, premature leafing out underground, corkscrewing of the coleoptile, death of the seminal root system, and deformed mesocotyl (see Figure 2). Germination may take as long as 12 days at soil temperatures of 57 degrees F. At even cooler temperatures, germination may be delayed and uneven, which has been shown to reduce yield due to the competitive effects of neighboring corn plants. Soil temperatures can vary quite a bit from field to field. Before planting, be sure to check actual soil temperature and the forecast for the next several days. Whenever possible, avoid ‘beat the rain’ planting scenarios and strive to plant when temperatures are expected to remain warm and stable after planting. Frost and Freeze Injury. While foliar frost injury can appear dramatic on young corn plants, the injury is usually cosmetic and the plant can make a full recovery. 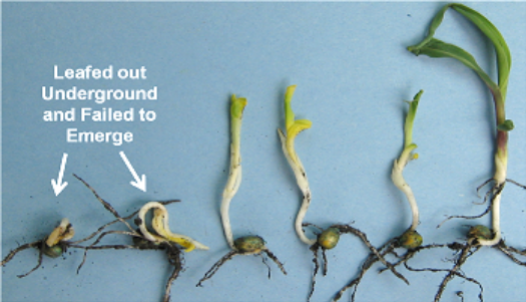 The reason for this is that stalk internodes begin to elongate just prior to V5 and eventually push the corn growing point above the soil surface by V6. Prior to V6, the growing point is underground and generally well-protected from frost. Extended cold temperatures can penetrate underground and damage the growing point. If the growing point appears discolored or mushy, the plant may not recover. Seedling Diseases. Cool, wet soils after planting also promote infection by the common seedling diseases Pythium, Fusarium, and Rhizoctonia. Pythium is an oomycete or ‘water fungus’ that produces motile zoospores that swim through the soil water to the root surface and infect the plant. Seed treatment fungicides that include metalaxyl and another broad-spectrum active ingredient should provide up to three weeks of protection after planting. Some fungicides are also labeled for in-furrow application, which may provide higher loading rates and extend the window of protection provided by seed treatments. Chronic wet conditions after planting may still overwhelm these defenses. Early Season Insects. Early planted corn that experiences delayed germination and slow growth rates may be more subject to damage from below-ground feeders like wireworms and white grubs. The small size and slow plant growth rate extends the potential window of feeding injury by these insects and makes the plant less capable of recovering or outgrowing the problem. By contrast, early planted corn may entirely avoid risks from migratory insects like black cutworm, because the plants have often grown beyond the vulnerable stage by the time the pest reaches active levels. High-rate seed treatment insecticides or in-furrow soil-applied products will usually provide adequate protection from below-ground feeders. Nutrient Availability. 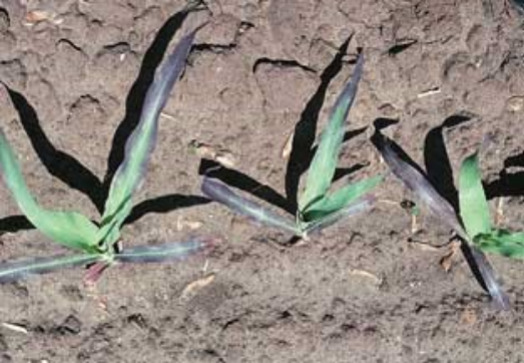 Slow growth rates and cool temperatures can restrict early season nutrient availability, leading to temporary deficiency symptoms like purple and yellow foliage (see Figure 3). Starter or pop-up fertilizers which place nutrient in close proximity to the seedling may help to alleviate some of these early season symptoms. Profitable yield response to starter fertilizer is more likely in challenging soils, no-till systems, and nutrient-deficient soils. Select a full-season hybrid with tall stature to capitalize on solar radiation. Use a premium seed treatment fungicide and insecticide to protect against early season threats, and scout for emerging threats. Use the high end of the range of optimum populations for the soil type and hybrid. Consider a starter or pop-up fertilizer application to alleviate early season nutrient availability issues. Long-term university studies have demonstrated that early planting provides the best opportunity for maximum corn yield. A relatively warm and dry spring season may tempt farmers to start planting corn earlier than normal, and for good reason. Long-term university studies have demonstrated that early planting provides the best opportunity for maximum corn yield. ​Listen to Jeff Bunting, Crop Protection Division Manager, discuss crop protection strategies for your farm.